Cite this guide: Brame, C.J. (2015). Effective educational videos. Retrieved [todaysdate] from http://cft.vanderbilt.edu/guides-sub-pages/effective-educational-videos/. Together, these considerations provide a solid base for the development and use of video as an effective educational tool. One of the primary considerations when constructing educational materials, including video, is cognitive load. Cognitive Load Theory, initially articulated by Sweller and colleagues (1988, 1989, 1994), suggests that memory has several components (see the figure). Sensory memory is transient, collecting information from the environment. Information from sensory memory may be selected for temporary storage and processing in working memory, which has very limited capacity. This processing is a prerequisite for encoding into long-term memory, which has virtually unlimited capacity. Because working memory is very limited, the learner must be selective about what information from sensory memory to pay attention to during the learning process, an observation that has important implications for creating educational materials. 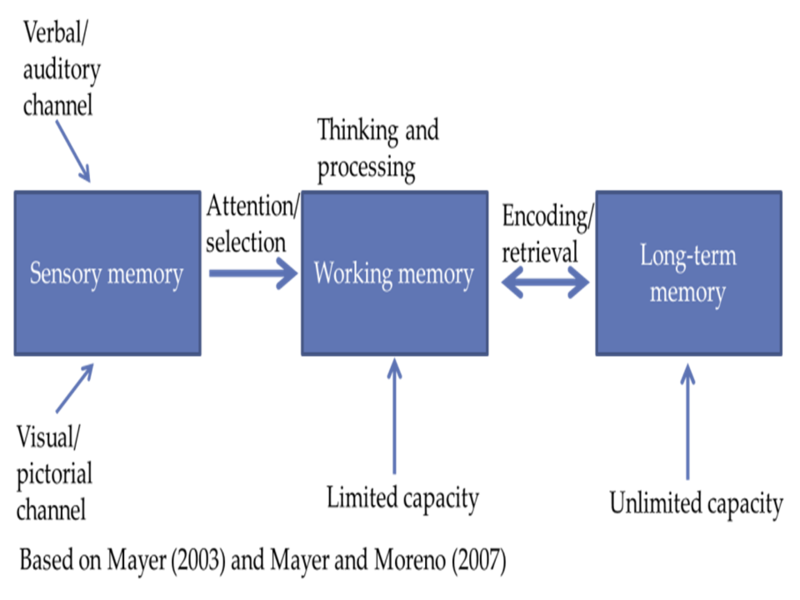 Based on this model of memory, Cognitive Load Theory suggests that any learning experience has three components (see the figure). The first of these is intrinsic load, which is inherent to the subject under study and is determined in part by the degrees of connectivity within the subject. The common example given to illustrate a subject with low intrinsic load is a word pair (e.g., blue = azul), whereas grammar is a subject with a high intrinsic load due to its many levels of connectivity and conditional relationships. The second component of any learning experience is germane load, which is the level of cognitive activity necessary to reach the desired learning outcome—e.g., to make the comparisons, do the analysis, elucidate the steps necessary to master the lesson. The ultimate goal of these activities is for the learner to incorporate the subject under study into a schema of richly connected ideas. The third component of a learning experience is extraneous load, which is cognitive effort that does not help the learner toward the desired learning outcome. It is often characterized as load that arises from a poorly designed lesson (e.g., confusing instructions, extra information), but may also be load that arises due to stereotype threat or imposter syndrome. These concepts are more fully articulated and to some extent critiqued in an excellent review by de Jong (2010). These definitions have implications for design of educational materials and experiences. Specifically, instructors should seek to minimize extraneous cognitive load and should consider the intrinsic cognitive load of the subject when constructing learning experiences, carefully structuring them when the material has high intrinsic load. Because working memory has a limited capacity, and information must be processed by working memory to be encoded in long term memory, it’s important to prompt working memory to accept, process, and send to long-term memory only the most crucial information (Ibrahim et al., 2012). The Cognitive Theory of Multimedia Learning builds on the Cognitive Load Theory, noting that working memory has two channels for information acquisition and processing: a visual/pictorial channel and an auditory/verbal processing channel (Mayer and Moreno, 2003). Although each channel has limited capacity, the use of the two channels can facilitate the integration of new information into existing cognitive structures. By using both channels, working memory’s capacity is maximized—but either channel can be overwhelmed by high cognitive load. Thus design strategies that manage the cognitive load for both channels in multimedia learning materials promise to enhance learning. 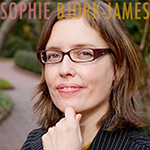 In addition to the two key assumptions of dual-channel processing and limited working memory capacity, the Cognitive Theory of Multimedia Learning also articulates the goal of any learning as “meaningful learning,” which requires cognitive processing that includes paying attention to the presented material, mentally organizing the presented material into a coherent structure, and integrating the presented material with existing knowledge (Mayer and Moreno 2003)1. Signaling, which is also known as cueing (deKoning et al., 2009), is the use of on-screen text or symbols to highlight important information. For example, signaling may be provided by the appearance of two or three key words (e.g., Mayer and Johnson, 2008; Ibrahim et al., 2012), a change in color or contrast (e.g., deKoning et al., 2009), or a symbol that draws attention to a region of a screen (e.g., an arrow; deKoning et al., 2009). By highlighting the key information, it helps direct learner attention, thus targeting particular elements of the video for processing in the working memory. This can reduce extraneous load by helping novice learners with the task of determining which elements within a complex tool are important, and it can also increase germane load by emphasizing the organization of and connections within the information. Mayer and Moreno (2003) and deKoning et al. (2009) have shown that this approach improves students ability to retain and transfer new knowledge from animations, and Ibrahim et al. (2012) have shown that these effects extend to video. Segmenting is the chunking of information to allow learners to engage with small pieces of new information as well as to give them control over the flow of new information. As such, it manages intrinsic load and can also increase germane load by emphasizing the structure of the information. Segmenting can be accomplished both by making shorter videos and by including “click forward” pauses within a video, such as using YouTube Annotate or HapYak to provide students with a question and prompting them to click forward after completion. Both types of segmenting have been shown to be important for student engagement with videos (Guo et al., 2014; Zhang et al., 2005), and learning from video (Ibrahim 2012; Zhang et al., 2006). Weeding is the elimination of interesting but extraneous information from the video, that is, information that does not contribute to the learning goal. For example, music, complex backgrounds, or extra features within an animation require the learner to judge whether he should be paying attention to them, which increases extraneous load and can reduce learning. Importantly, information that increases extraneous load changes as the learner moves from novice toward expert status. That is, information that may be extraneous for a novice learner may actually be helpful for a more expert-like learner, while information that is essential for a novice may serve as an already-known distraction for an expert. Thus, it’s important that the instructor consider her learners when weeding educational videos, including information that is necessary for their processing but eliminating information that they don’t need to reach the learning goal and that may overload their working memory. Ibrahim (2012) has shown that this treatment can improve retention and transfer of new information from video. Matching modality is the process of using both the audio/verbal channel and the visual/pictorial channel to convey new information, fitting the particular type of information to the most appropriate channel. For example, showing an animation of a process on screen while narrating it uses both channels to elucidate the process, thus giving the learner dual and complementary streams of information to highlight features that should be processed in working memory. In contrast, showing the animation while also showing printed text uses only the visual channel and thus overloads this channel and impedes learning (Mayer and Moreno, 2003). In another example, using a “talking head” video to explain a complex process makes productive use only of the verbal channel (because watching the speaker does not convey additional information), whereas a Khan-style tutorial that provides symbolic sketches to illustrate the verbal explanation uses both channels to give complementary information. Using both channels to convey appropriate and complementary information has been shown to increase students’ retention and ability to transfer information (Mayer and Moreno, 2003) and to increase student engagement with videos (Thomson et al., 2014; Guo et al., 2014). The table below gives a brief summary of how and why to use these practices. One of the most important aspects of creating educational videos is to include elements that help promote student engagement. If students don’t watch the videos, they can’t learn from them. Lessons on promoting student engagement derive from earlier research on multimedia instruction as well as more recent work on videos used within MOOCs. Keep it short. 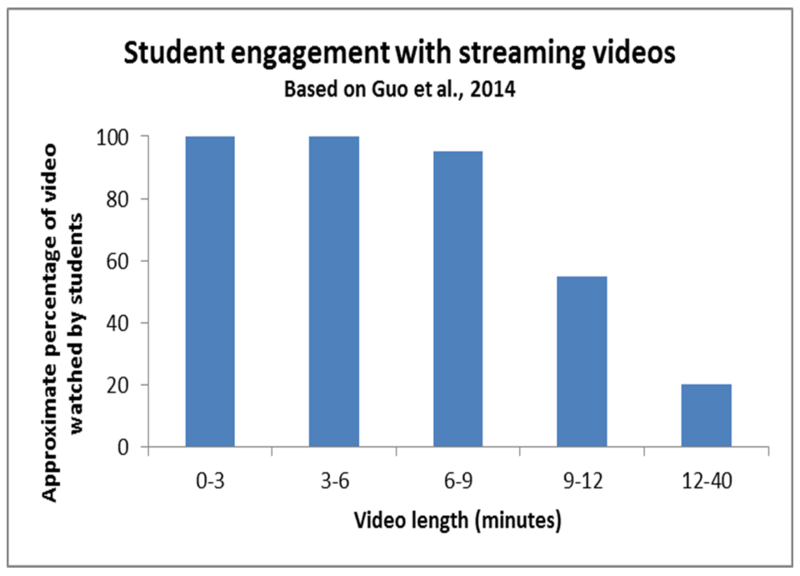 Guo and colleagues examined the length of time students watched streaming videos within four edX MOOCs, analyzing results from 6.9 million video watching sessions (2014). They observed that the median engagement time for videos less than six minutes long was close to 100%–that is, students tended to watch the whole video (although there are significant outliers; see the paper for more complete information). As videos lengthened, however, student engagement dropped off, such that the median engagement time with 9-12 minute videos was ~50% and the median engagement time with 12-40 minute videos was ~20%. In fact, the maximum median engagement time for a video of any length was six minutes. Making videos longer than 6-9 minutes is therefore likely to be wasted effort. Use a conversational style. Called the personalization principle by Richard Meyer, the use of conversational rather than formal language during multimedia instruction has been shown to have a large effect on students’ learning, perhaps because a conversational style encourages students to develop sense of social partnership with the narrator that leads to greater engagement and effort (Meyer, 2008). Speak relatively quickly and with enthusiasm. In their study examining student engagement with MOOC videos, Guo and colleagues observed that student engagement was dependent on the narrator’s speaking rate, with student engagement increasing as speaking rate increased (2014). It can be tempting for video narrators to speak slowly to help ensure that students grasp important ideas, but including in-video questions , “chapters”, and speed control can give students control over this feature—and increasing narrator speed appears to promote student interest. Make sure the material feels like it is for these students in this class. One of the benefits for instructors in creating educational videos is the ability to reuse them for other classes and other semesters. When reusing videos, it’s important to package them with text outside the video to contextualize them for the particular class for which they are being used. Further, it’s important to create them for the type of environment in which they will be used. Guo and colleagues examined student engagement with MOOC videos that were created by chopping up videotaped lectures that had been presented in a face-to-face class (Guo et al., 2014). Student engagement was significantly less than when lectures were created with the MOOC environment in mind. Match modality. While this consideration is important for managing cognitive load, it is also relevant to promoting student engagement. When telling a story, it can be very effective to show the storyteller’s face or to show an animation of the story (see Jay Clayton example: https://class.coursera.org/onlinegames-003/lecture). When solving a problem, Khan academy-style videos are particularly helpful, showing students step-by-step with narration how to work through the problem (Guo et al., 2014). When teaching about an invisible phenomenon, it can be helpful to provide an illustration. In each case, providing visual elements that add to the lesson can not only promote student understanding but also engagement with the lesson. To help students get the most out of an educational video, it’s important to provide tools to help them process the information and to monitor their own understanding. There are multiple ways to do this effectively. Use guiding questions.Lawson and colleagues examined the impact of guiding questions on students’ learning from a video about social psychology in an introductory psychology class (2006). Building on work from Kreiner (1997), they had students in some sections of the course watch the video with no special instructions, while students in other sections of the course were provided with eight guiding questions to consider while watching. The students who answered the guiding questions while watching the video scored significantly higher on a later test. Use interactive features that give students control. Zhang and colleagues compared the impact of interactive and non-interactive video on students learning in a computer science course (2006). Students who were able to control movement through the video, selecting important sections to review and moving backwards when desired, demonstrated better achievement of learning outcomes and greater satisfaction. 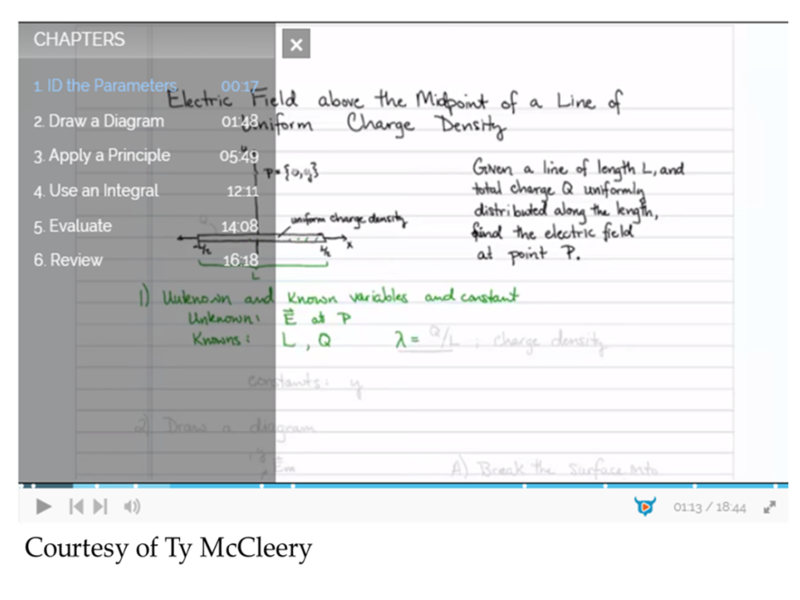 One simple way to achieve this level of interactivity is by using YouTube Annotate, HapYak, or another tool to introduce labeled “chapters” into a video. This not only has the benefit of giving students control, but also can demonstrate the organization, increasing the germane load of the lesson. 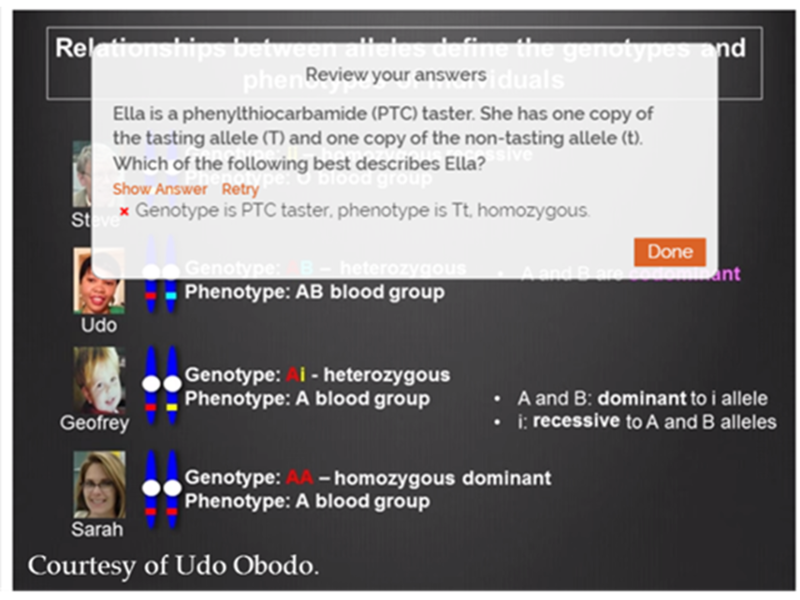 Integrate questions into the video.Tools like HapYak can allow instructors to incorporate questions directly into video and to give feedback based on student response. Vural compared the effect of video with embedded questions to interactive video without embedded questions in pre-service teachers, finding that the embedded questions improved the students’ performance on subsequent quizzes (2013). Make video part of a larger homework assignment. 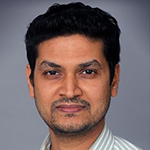 Faizan Zubair and Mary Keithly are each part of the BOLD Fellows program at Vanderbilt University, in which graduate students develop online learning materials for incorporation into a faculty mentor’s course. Faizan developed videos on that were embedded in a larger homework assignment in Paul Laibinis’ Chemical Engineering class, and found that students valued the videos and that the videos improved students’ understanding of difficult concepts when compared to a semester when the videos were not used in conjunction with the homework. Mary worked with Kathy Friedman to develop videos and follow-up questions to serve as pre-class preparation in a genetics class. Although there was no apparent change to learning outcomes in the class, students valued the videos and post-video questions as learning tools and thought that they were effective for promoting student understanding. The important thing to keep in mind is that watching a video can be a passive experience, much as reading can be. To make the most of our educational videos, we need to help students do the processing and self-evaluation that will lead to the learning we want to see. The particular way you do this should be guided by goals of the course and the norms of your discipline. Keep videos brief and targeted on learning goals. Use audio and visual elements to convey appropriate parts of an explanation; make them complementary rather than redundant. Use signaling to highlight important ideas or concepts. Use a conversational, enthusiastic style to enhance engagement. Embed videos in a context of active learning by using guiding questions, interactive elements, or associated homework assignments. Allen WA and Smith AR (2012). Effects of video podcasting on psychomotor and cognitive performance, attitudes and study behavior of student physical therapists. Innovations in Education and Teaching International 49, 401-414.
deKoning B, Tabbers H, Rikers R, and Paas F (2009). Towards a framework for attention cueing in instructional animations: Guidelines for research and design. Educational Psychology Review 21, 113-140.
deJong T (2010). 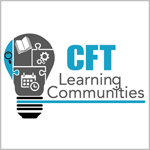 Cognitive load theory, educational research, and instructional design: Some food for thought. Instructional Science 38, 105-134. Guo PJ, Kim J, and Robin R (2014). How video production affects student engagement: An empirical study of MOOC videos. ACM Conference on Learning at Scale (L@S 2014); found at http://groups.csail.mit.edu/uid/other-pubs/las2014-pguo-engagement.pdf. Hsin WJ and Cigas J (2013). Short videos improve student learning in online education. Journal of Computing Sciences in Colleges 28, 253-259. Ibrahim M, Antonenko PD, Greenwood CM, and Wheeler D (2012). Effects of segmenting, signaling, and weeding on learning from educational video. Learning, Media and Technology 37, 220-235. Kay RH (2012). Exploring the use of video podcasts in education: A comprehensive review of the literature. Computers in Human Behavior 28, 820-831. Kreiner DS (1997). Guided notes and interactive methods for teaching with videotapes. Teaching of Psychology 24, 183-185. Lawson TJ, Bodle JH, Houlette MA, and Haubner RR (2006). Guiding questions enhance student learning from educational videos. Teaching of Psychology 33, 31-33. Lloyd SA and Robertson CL (2012). Screencast tutorials enhance student learning of statistics. Teaching of Psychology 39, 67-71. Mayer RE (2001). Multimedia learning. New York: Cambridge University Press. Mayer RE (2008). Applying the science of learning: Evidence-based principles for the design of multimedia instruction. Cognition and Instruction 19, 177-213. Mayer RE and Johnson CI (2008). Revising the redundancy principle in multimedia learning. Journal of Educational Psychology 100, 380-386. Mayer RE and Moreno R (2003). Nine ways to reduce cognitive load in multimedia learning. Educational Psychologist 38, 43-52. Rackaway C (2012). Video killed the textbook star? Use of multimedia supplements to enhance student learning. Journal of Political Science Education 8, 189-200. Schmid RF, Bernard RM, Borokhovski E, Tamim RM, Abrami PC, Surkes MA, Wade CA, and Woods J. (2014). The effects of technology use in postsecondary education: A meta-analysis of classroom applications. Computers & Education, 72, 271-291. Sweller J (1988). Cognitive load during problem solving: Effects on learning. Cognitive Science 12, 257-285. Sweller J (1989). Cognitive technology: Some procedures for facilitating learning and problem-solving in mathematics and science. Journal of Educational Psychology 81, 457-466. Sweller J (1994). Cognitive load theory, learning difficulty, and instructional design. Learning and Instruction 4, 295-312. Thomsen A, Bridgstock R, and Willems C (2014). ‘Teachers flipping out’ beyond the online lecture: Maximising the educational potential of video. Journal of Learning Design 7, 67-78. Vural OF (2013). The impact of a question-embedded video-based learning tool on e-learning. Educational Sciences: Theory and Practice 13, 1315-1323. Zhang D, Zhou L, Briggs RO, and Nunamaker JF Jr. (2006). 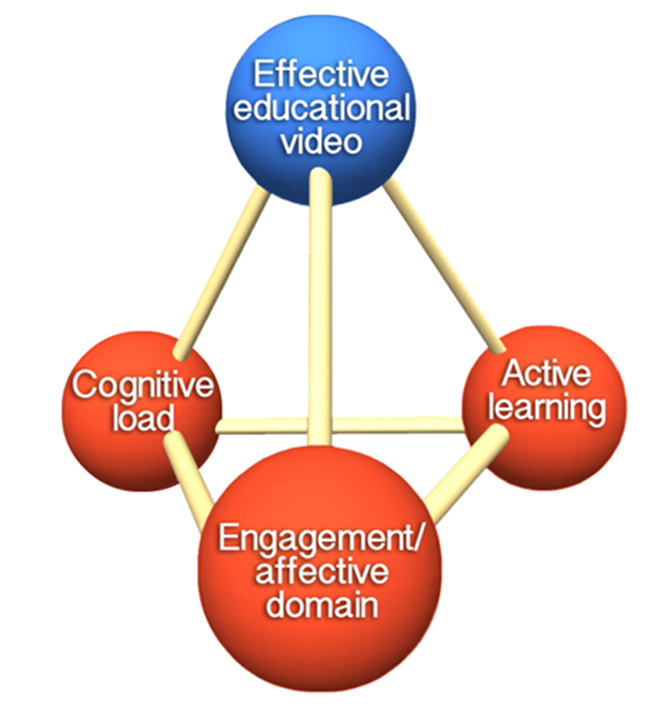 Instructional video in e-learning: Assessing the impact of interactive video on learning effectiveness. Information & Management 43, 15-27. 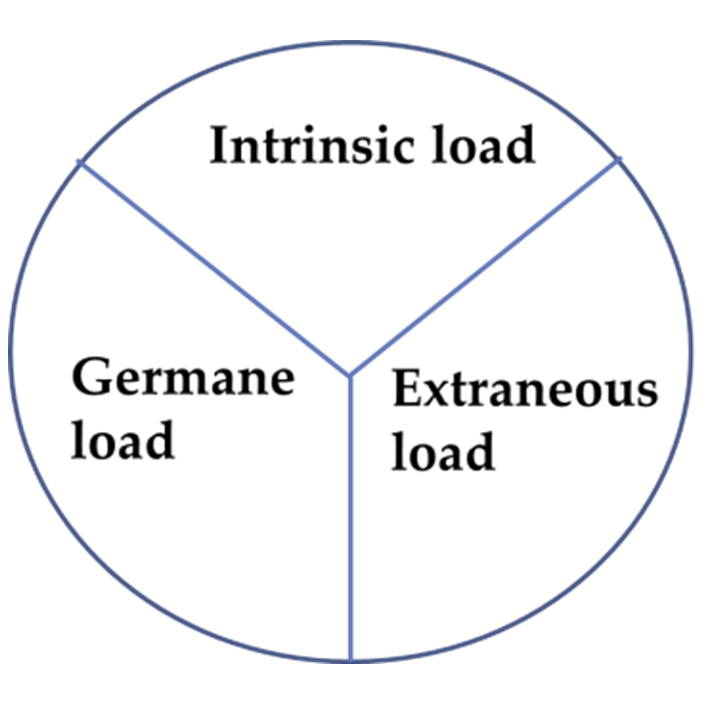 1Mayer and Moreno talk about essential processing, incidental processing, and representational holding as rough equivalents of germane load, extraneous load, and intrinsic load. Brame, C.J. (2015). Effective educational videos. Retrieved [todaysdate] from http://cft.vanderbilt.edu/guides-sub-pages/effective-educational-videos/.